Do you have patches laying on your counter, desk, or in the bottom of your drawers? Do you really need to get those patches put on your uniform? 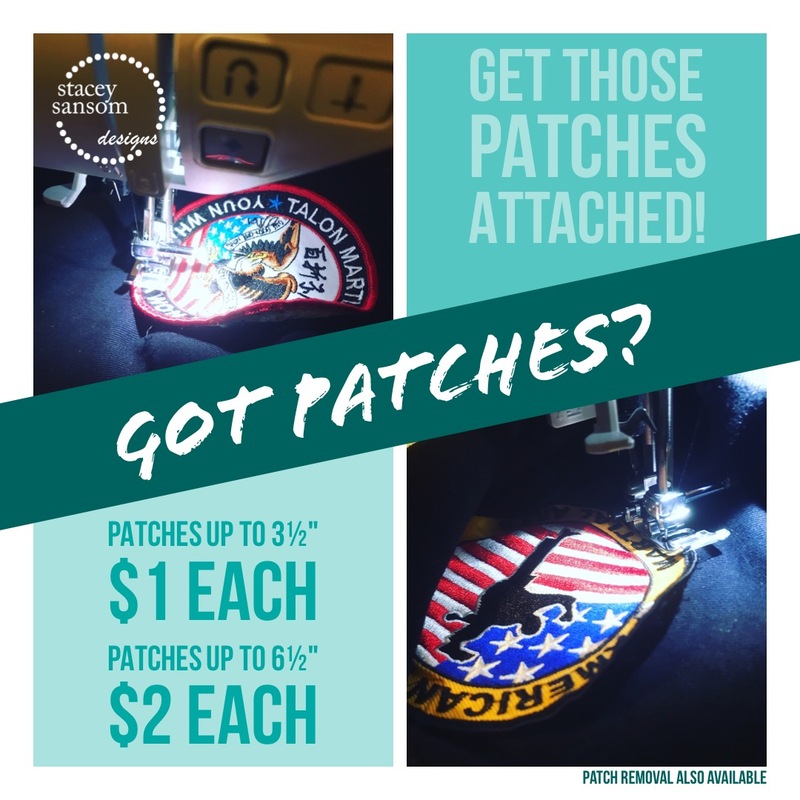 Did you know that Stacey Sansom Designs now offers Patch Sewing Services? Do you need PATCHES SEWN ON? Schedule your session and drop-off today so that you can get those patches on your uniform (or other items) where they belong. All prices are PER PATCH. * Sleeve patches often require hand-sewing due to the size of the sleeve. Each hand sewn patch will incur an additional $1.00 fee. ° Removal of glued on patches extra. Please contact Stacey Sansom Designs for associated fees. No high school letter jackets please! Discounts are offered for bulk patches. Please contact Stacey Sansom Designs for additional information about possible discounts available for your individual needs. Patches common on Boy Scout, Cub Scout, and Girl Scout uniforms will be discounted if they can be sewn together to make 1 patch before attaching to the garment. This is typical of Pack and/or Troop number patches. All Patch Sewing Sessions are on Monday Morning and a limited number of twelve (12) sessions are available. Each patch counts as a session. Please contact Stacey Sansom Designs if you have more than 12 patches to sew on at one time. Once you “book your session” you will be contacted directly to arrange drop-off and invoiced accordingly. ALL PATCHES ARE SEWN ON during the Monday Morning block of time you selected. Drop-off must be made BEFORE your booked session. It is your responsibility to make sure your items are picked-up in a timely manner. Please make these arrangements when you drop-off your items. Invoices must be paid before items will be returned, no exceptions. Unfortunately, I have to have some policies in place for my protection and yours. I cannot work if I am exposed to the following migraine and allergy triggers. All garments MUST BE clean and laundered! This is a sanitary and health policy. No exceptions! Please wash and/or dry clean before bringing for your Patch Sewing Session. All garments MUST BE clean of all animal hair. No exceptions. Please wash and immediately put into a zippered bag if you have pets. Please put patches to be attached to the garment in the bag(s). All garments MUST BE clean of smoke. No exceptions. Please wash and immediately put into a zippered bag if you or a family member smokes. Please put patches to be attached to the garment in the bag(s). All garments MUST BE clean of strong smells/odors. Please be considerate of myself and my family. Please use a mildly scented or unscented detergent. Failure to comply with the below policies will incur an additional $2.50 cleaning and maintenance fee per garment. Smoke, animal hair, dirt, and dust can gum up my machines and my head. Please be considerate. I appreciate your understanding and compliance to the above policies. Previous post: Made a purchase? Leave a review!